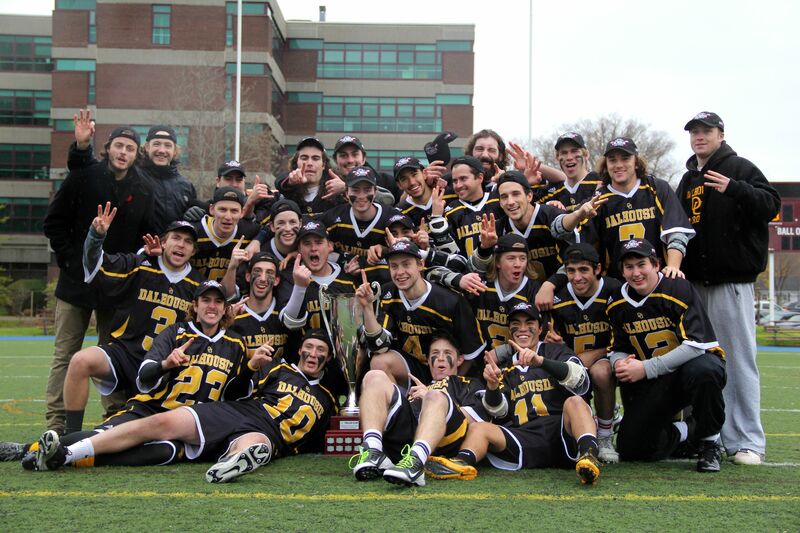 Turns out, winning a league championship doesn’t get old for Dalhousie men’s lacrosse. When the champagne bottle had been emptied, the last hugs exchanged and the hollers had finally died down, the Tigers once again proved they are the finest team in local campus lacrosse. Dal’s 17-10 triumph against St. FX Nov. 10 was the university’s third consecutive Maritime University Field Lacrosse title and their fifth such honour in the last six years. New head coach Connor DuBreuil knows what this trophy means for the club’s legacy. He told his troops that it’s this sustained success the program has been building toward, he said. “It’s the guys who have been here that know how it works and know what it takes to be champions,” he said from a jubilant scene at Huskies Stadium. The Tigers, up 14-7, encountered a scare in the fourth quarter from a vengeful X-Men squad. Down by seven points, St. FX found another gear, scoring a trio of goals in quick succession to pull themselves within contention. The vocal X-Men fan contingent erupted. St. FX could have rallied like they did the night before to beat hometown Saint Mary’s and earn their third straight ticket to championship Sunday. But then came nearly two minutes of sustained possession. Dal’s veterans corralled the ball around the perimeter of the offensive zone, draining the clock, as X-Men defenders tried in vain to strip the ball away. Six minutes left on the clock became four minutes by the time Duane Davis fired his fifth goal of the game from the slot to tally Dal’s 15th marker of the match and virtually seal the victory in their favour. His third consecutive championship was just as sweet as the first two, said Davis. The Tigers went undefeated in the regular season, claiming all eight contests by a combined score of 142-55. They beat Mount Allison 17-4 in the semifinal. “To go undefeated in the regular season and not lose on championship weekend, it’s a pretty special feat in our league. They’re ranked up there as one of our best teams for sure,” said DuBreuil, a former team member. Dal last suffered defeat on Sept. 12, 2012 when they lost to Saint Mary’s by a point. DuBreuil handed the game ball at the end of the match to Paul Dimitruk and John Gagnier, two graduates (and roommates) who have played their last match with the program. Dimitruk isn’t sure who will keep the relic. They cannot split it in two, after all. “I don’t know, we’ll figure it out. Maybe we’ll go week-by-week or something,” he said. League leading scorer Ricky Canning added three goals for the Tigers in the winning effort. The game’s offensive MVP, Jack Inglis, contributed with two markers.